Skin under the eyes, relatively thinner when compared to that of the other parts of the body, appears dark in certain people because of a number of reasons including weariness, some lifestyles, genetic make-up, and age. Dark circles appear due to the production of surplus melanin, a pigment that imparts skin, hair, and eyes their color. Especially for people with fair skin, dark circles are clearly noticeable. A make-up kit can only help you mask the dark circles under the eye, but cannot get rid of them. You can do away with these concerning shadowy blemishes using essential oils extracted from parts of plants and trees such as flowers, stems, leaves, barks, and roots. Mooi Naturals Cranberry Eye Contour Serum, a blend of 100% Natural Grape seed oil, Pomegranate Seed Oil, Carrot Seed Oil, and Cranberry Essential Oil is rich in vitamins and antioxidants, helps skin cell regeneration, protects from sun rashes, and fosters collagen and elastin production. The soothing and repairing serum acts effective for the eye contour area. It revitalizes the eye lids, reduces dark circles, and nourishes and hydrates the under eye area, thereby reducing fine lines and is perfect for aging, rough, dry, and scaly skin. 1. After cleansing,roll on the Eye serum OR Take few drops of the product onto the ring finger. 2. With starting at the inner corner of each eye,press and apply the product along the eye socket,applying a little pressure with due delicacy – just enough to stimulate the area. 3. Continue till your temples and finish at the upper inner corner of your eyes. 4. If the product has sunk in without trace, skin is thirsty and you can afford to repeat. Skin under the eyes, relatively thinner when compared to that of the other parts of the body, appears dark in certain people because of a number of reasons including weariness, some lifestyles, genetic make-up, and age. Dark circles appear due to the production of surplus melanin, a pigment that imparts skin, hair, and eyes their color. Especially for people with fair skin, dark circles are clearly noticeable. A make-up kit can only help you mask the dark circles under the eye, but cannot get rid of them. You can do away with these concerning shadowy blemishes using essential oils extracted from parts of plants and trees such as flowers, stems, leaves, barks, and roots. 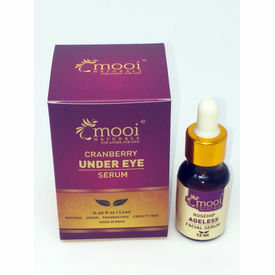 Mooi Naturals Cranberry Eye Contour Serum, a blend of 100% Natural Grape seed oil, Pomegranate Seed Oil, Carrot Seed Oil, and Cranberry Essential Oil is rich in vitamins and antioxidants, helps skin cell regeneration, protects from sun rashes, and fosters collagen and elastin production. The soothing and repairing serum acts effective for the eye contour area. It revitalizes the eye lids, reduces dark circles, and nourishes and hydrates the under eye area, thereby reducing fine lines and is perfect for aging, rough, dry, and scaly skin. Directions for use : 1. After cleansing,roll on the Eye serum OR Take few drops of the product onto the ring finger.2. With starting at the inner corner of each eye,press and apply the product along the eye socket,applying a little pressure with due delicacy – just enough to stimulate the area.3. Continue till your temples and finish at the upper inner corner of your eyes.4. If the product has sunk in without trace, skin is thirsty and you can afford to repeat. Disclaimer : Always recommend to do a patch test for compatibility prior to using any new products. 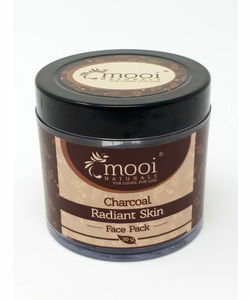 All of Mooi Naturals products are vegan and cruelty free and do not contain either synthetic ingredients or ingredients of animal origin. Vitis Vinifera (Grape) Seed Oil Grape seed oil moisturizes skin,helps in skin tightening and toning. The antioxidant rich oil minimizes under eye circles and slows down the ageing process. Punica granatum linn (Pomegranate) Oil Pomegranate seed oil is full of antioxidants and acts as one of the best natural skin moisturizers. 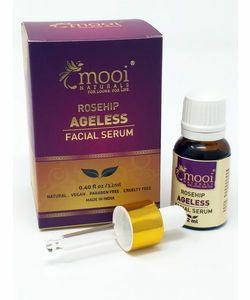 It fades wrinkles and fine lines, improves skin elasticity and gives it a healthy glow. It also is a potent source of punic and ellagic acids (commonly found in berries and walnuts), which then help protect dry cracked, mature and irritated skin. Daucus carota (Carrot Seed) Oil Carrot seed oil is the most potent source of carotenoids,nourishes dry skin, and can even reduce the appearance of fine lines and wrinkles! The oil has a natural SPF of 40, so it can even serve as a topical sunscreen! Vaccinum macrocarpon (Cranberry) Essential Oil Cranberry Essential Oil is rich in tocotrienols (vitamin E) and possesses a unique balance of omega 3, 6 and 9 EFAs.The Oil is highly moisturizing and easily penetrates into the skin.The cranberry oil acts as a toner that helps firm the delicate under eye skin. Minimizes Under Eye Dark Circles.